What does it mean to be a Friend of the Lake Artists Society? An invitation to the Friends Wine Reception (first private view) and to the exhibition Private View. Unlimited free access to the exhibition accompanied by one guest on each occasion. 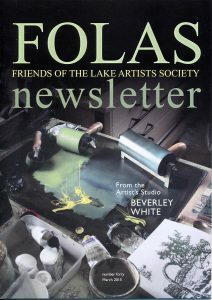 A full colour Newsletter in June and November each year with news, events, articles plus occasional FOLAS offers exclusive to members. Assistance with contacting LAS members regarding commissions etc. Early May for the June edition. Early October for the November edition. All contributions should be sent to the editor c/o the FOLAS Secretary.